I was feeling creative after searching Pinterest for things to do with all my tomatoes. Tomato tarts, pies and pizzas kept showing up, and I thought, can I make those into a Bloody Mary dish? I’ve mentioned my lack of cooking skills, but I figured even if what I create isn’t great, it will surely still be edible. So I gave it a shot. If you’ve made a homemade Bloody recently you probably have most of the ingredients you’ll need already in your cupboard. And since I’m not a cook, the process is fairly easy. I had a precooked pizza shell in the freezer from a previous pizza night, so I thought I’d use that. But it turned out to be far too freezer burned and dry so I had to go to the store for something else. I picked up a precooked shell from Tops, whole wheat on accident but that’s ok, it’s still tasty. You could use a Boboli, or even roll out fresh dough if you so choose but cooking temps and times may vary. Preheat your oven to 400 degrees, and don’t forget your pizza stone if you have one. Leave your cream cheese out to soften a bit, so it’ll be easier to mix together with the other ingredients. Meanwhile you can start slicing your tomatoes. 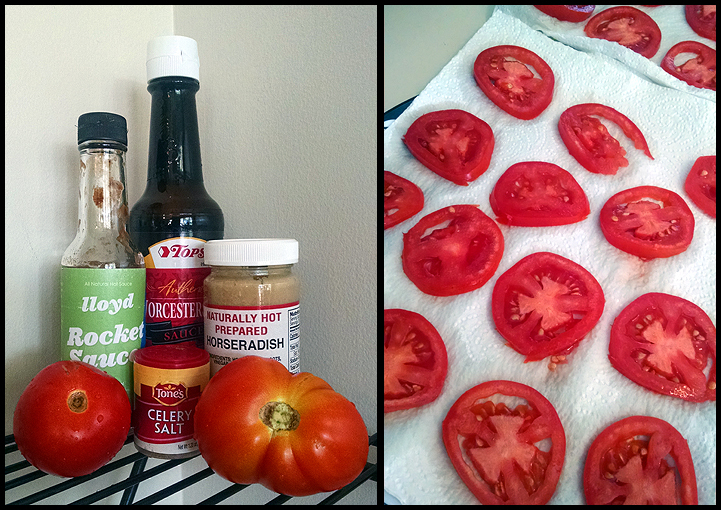 Man, it’s so hard to slice ripe tomatoes thin, but do the best you can. I didn’t even attempt to use the mandolin slicer, I figured it would just massacre the tomatoes. When you get to the stub of the tomato, that you can’t slice anymore, throw some salt and pepper on it and eat it! Yum! Place the slices on some paper towels and sprinkle lightly with some salt, and let sit for at least 15 minutes to soak up some of their moisture, or your pizza will be a bit moist. I used 6 medium tomatoes, depending on the size of the pizza shell or dough you rolled out you may need more or less. I ended up having 3 extra slices, so I ate those too! For the sauce I used about 4oz of cream cheese, because that’s what I had. 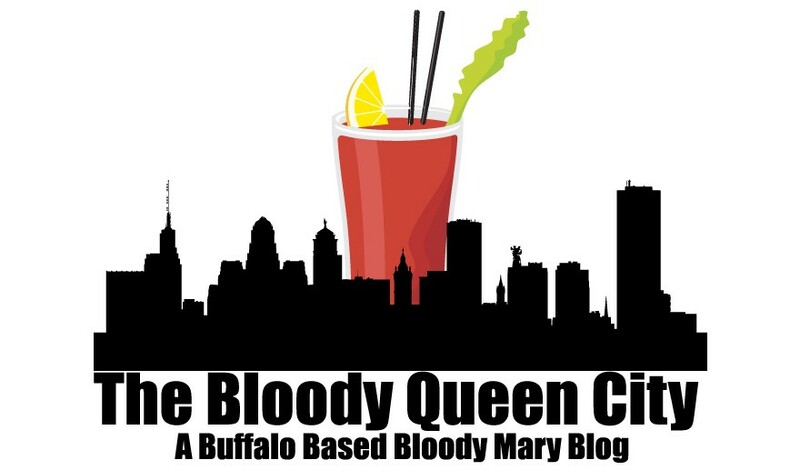 I stuck with my standard favorite ingredients for a good Bloody, but of course you can add whatever other kind of flavorings into the cream cheese that you want. Once it’s appropriately softened add the Worcestershire sauce, horseradish, hot sauce, celery salt and some peppper and mix together until combined. Taste to make sure it’s to your liking and adjust as necessary. Spread the sauce onto your dough and lay the tomato slices on top, overlapping a bit as you go. I had extra sauce, which I just dumped, but you could use it as a dipping sauce for the crust if you like. Once the tomatoes are all in place sprinkle some pepper over the top of the pizza. At this point you can add some other toppings based on your favorite Bloody Mary garnishes. I sprinkled some precooked bacon on top of mine but you could also use olives, onions, hot peppers etc. You could also make it into a more traditional pizza by adding cheese but I didn’t think it was necessary. Once your pizza is ready and the oven is hot, bake for 15 minutes. The tomatoes will start to shrivel up and your dough will brown nicely. After the 15 minutes I turned the broiler on and let the pizza sit under it for another 2 minutes. The dough got a little more brown, but it crisped up the bacon nicely. Remove from the oven and let sit a bit before cutting. The sauce had a good spice level with a hint of horseradish, the crust was crispy and the tomatoes nice and soft. All in all I think it was a pretty good attempt, try it sometime.